MIKE CARRILLO (20) rushed for three touchdowns and caught one scoring pass for Garden Grove against Western Friday night (Orange County Tribune photos by Jim Tortolano). When two high powered offenses meet, it usually means the team that has the better defense will win the game. On Friday night Western High School of Anaheim visited Garden Grove High at Monsoor Memorial Stadium for the second to last non-league game of the season for both teams. The Pioneers entered the match with a 4-1 record overall, one of the best starts for them since 2012 when they opened their campaign 3-2. The Argonauts were undefeated this season with a 5-0 record overall. Western’s quarterback Anthony Munoz was the leading passer the Pac-4 in league with 1674 yards through five games coming into the game. Garden Grove’s running back Mike Carrillo was leading rusher in the new Big –4 League with 880 yards through the first five games. Both of these players had a game to remember tonight. The game was a nail bitter, with both teams were marching up and down the field the entire game and the team with the ball at the end of the game was most likely going to win this one. The defense for both teams played as hard as they could but a shootout was on the menu for tonight as the Pioneers defeated the Argonauts 35-31. Carrillo finished the game with 233 yards rushing with three touchdowns on the ground and three catches for 69 yards and a touchdown in the air. “I was trying to get the win, I just pounded the ball,” Argo coach Ricardo Cepeda said about his workhorse Carrillo when asked about the number of rushing attempts he had tonight. Carrillo ran the ball over 35 times and is the first running back in the league to break the 1000-yard threshold this season in the Big-4. ANTHONY MUNOZ (10) passed for 453 yards and five TDs in Western’s 35-31 win over Grove on Friday. That meant that that Grove didn’t throw the ball that much. Quarterback Jacob Zazueta attempted seven passes, completing four of them for 116 yards and the one touchdown to Carrillo. Munoz put up video game-like numbers tonight passing for 453 yards and five touchdowns. “This guy, his composure is unbelievable, the guy puts it in the window every time,” said Coach Dan Davidson of Western about Munoz about his quarterback after the game. 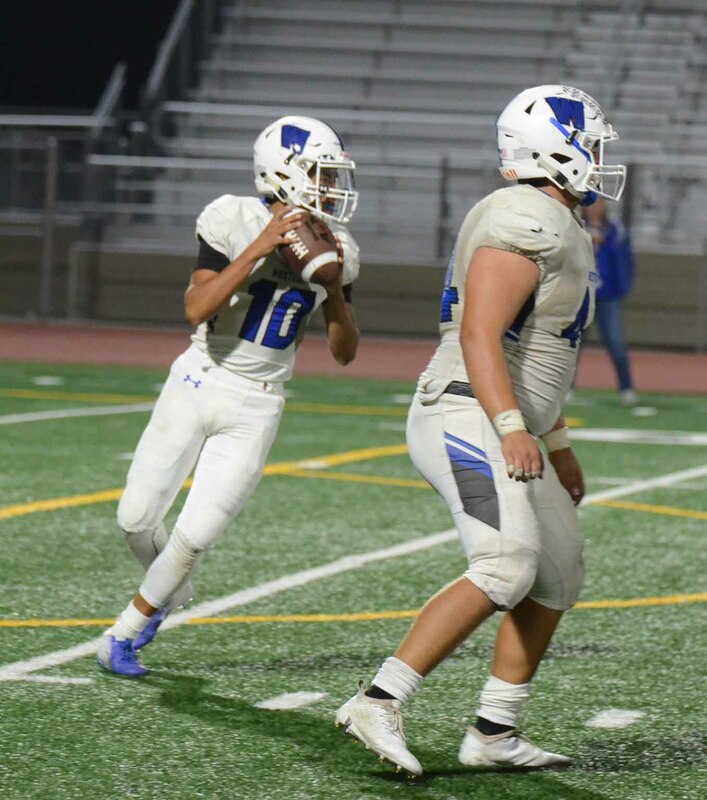 The game started off with some bad luck for Munoz, after driving the ball down the field on the opening drive he threw a pick in the end zone to Jordan Sanchez of Grove. Sanchez intercepted Munoz twice in the game overall. 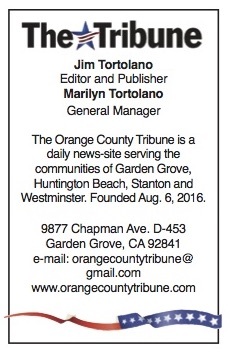 This allowed Grove to march down the field for 70 yards capped off with a 2-yard touchdown run from Carrillo. The Argonauts were not too happy after their first loss of the season. Coach Cepeda after the game said “We didn’t want to give up big plays and we wanted to control the ball. 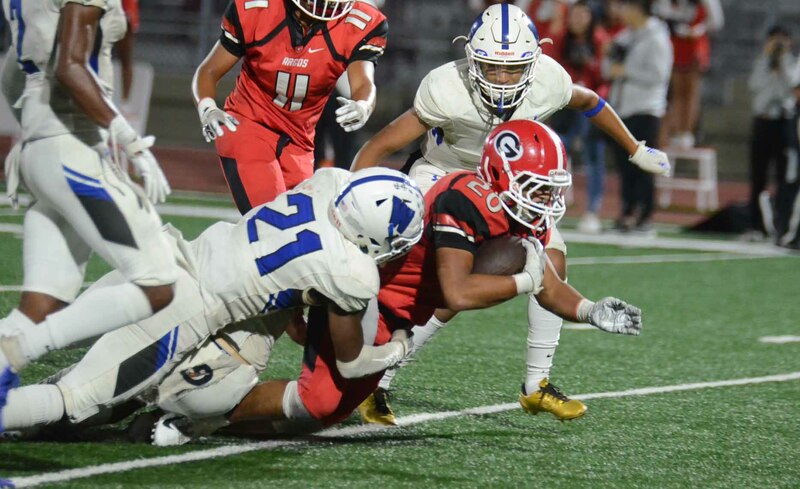 We knew we needed to score about 40 points and we thought we did.” Grove had nine holding penalties including a crucial one on an 50-yard touchdown run for Carrillo which would have put them up by 10 late in the fourth quarter. With conference play inching ever closer for these two teams, Friday night’s contest was a litmus test for both coaches to see what they need to fix next week before the really important games start up. Garden Grove (5-1) will face off against Laguna Hills High School (1-4) on the road next Friday while Western (5-1) will head up to Artesia High School (4-2) on Friday to take on another team with the nickname of Pioneers. Both games are at 7 p.m.